A closer look at web tools and sites that boost research and empower Great Lakes communities to secure a healthy environment and economy. For over two years, the Limno Loan program has been shaking up science class across the Great Lakes region. Coordinated by IISG and the U.S. EPA Great Lakes National Program Office, the program gives students an opportunity to collect water quality data from local waterways with the same kind of monitoring sensors used by scientist aboard the R/V Lake Guardian. 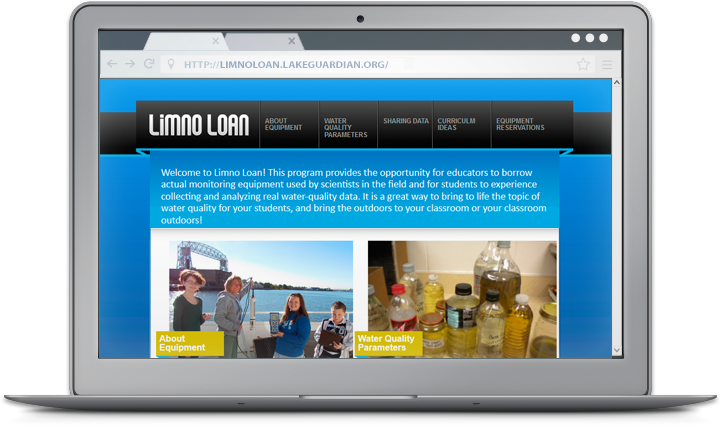 And now, teachers can take their Hydrolab projects one step further with help from IISG’s new Limno Loan site. In addition to information about the equipment and the parameters it measures, the site provides lessons and activities to help teachers K-12 better integrate the Hydrolab into their aquatic science sections. The activities, most of which were created by educators who used the equipment in their own classrooms, focus on demonstrating the connections between water quality, aquatic food webs, and human activities. Sample water quality data sheets are also available. The website also provides a unique opportunity for classes to share their data and compare it to information collected by fellow students across the region. New activities will be added as they are developed, so be sure to check back later. You can also read more about how the Limno Loan program has helped improve student understanding of Great Lakes sciences in our Winter 2012 Helm.